True Book Addict...True to Books: ARMCHAIR BEA...WELCOME! This is my second year participating in this event. I had hoped to go to BEA this year in New York, but the funds were just not available. Stupid money tree died! *L* Anyway, I'm so excited to join in the fun again this year. I have a busy week ahead of me. I'm participating in a week long read-a-thon through Goodreads and I have a blog tour review and guest post this week. Plus, several end of school year activities at my sons' school. Whew! So I'm going to try to do as much as I can with A. BEA. I have an interview with a fellow blogger on Wednesday that I'm pretty excited about. I will see what else I can do as the week progresses. Okay...a little bit about my blogging and reading. I have been book blogging for almost two years (in August). I have loved reading my whole life. I was lucky enough to have parents who had their noses stuck in a book constantly and it really rubbed off! I own a huge amount of books...3000+...that's 1900+ fiction and the rest non-fiction and Christmas books. I guess it's pretty obvious from those numbers that I'm a book lover...or maybe a hoarder? What I like to read is pretty much summed up in the tagline in my blog header. "An eclectic reader with an affinity for history and historical fiction" I adore historical fiction and that is largely due to my love of history. Up until last year, I was a history major and I'm hoping to get back to it as soon as I get some issues ironed out. If I had to choose a couple of other favorite genres, they would be fantasy (epic or high, not urban) and horror. I love fantastical worlds and I LOVE getting the stuff scared out of me! I am also a writer. I have a writing blog and I'm currently participating in a writing challenge to get me motivated. I'm actually in the process of researching my novel, but my ideas keep changing and that makes it difficult. I really want to write historical fiction, but I worry about authenticity. Can I do it? Can I write an historical that doesn't rip history to shreds? It's a worry and it's paralyzing! Back to this blog, I am a read-a-thon addict! So much so that I host seasonal read-a-thons. I just had my Spring one in April and my Summer read-a-thon is coming up in July. I also host two perpetual reading challenges, The Michener Challenge and the 101 Fantasy Reading Challenge. Some personal things about me: I am a Yankee by birth. I grew up in Michigan, but have lived in Nashville, Tennessee for 20 years. I have two sons that I love so much and am grateful for every day. Being a mom is really the best thing in the world! I am a major cat lover. If you've been here before, you've probably seen my Cat Thursday meme. I used to have five cats, but now we are down to one very spoiled Alice. Let's see, what else? Oh! I have a fanatical love for Christmas. Yes, I'm one of them! I have a year round Christmas blog on which I post every 25th of the month, throughout July, and from Thanksgiving through Twelfth Night. 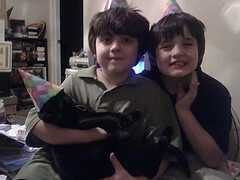 My boys and Alice...her 4th birthday! Well, that's it! I'm looking forward to this week. I will try to visit as many of your blogs as I can. I hope you all have a wonderful Armchair BEA experience! Gollee, your post should excite any visitors who stop by. You made me excited, and I visit your blog every week. Hi neighbor! I am a native of Michigan and I live in Alabama. Nice to find your blog and have a new blog to follow. Hope we can stay connected. Have fun with the Armchair BEA, it's been fun so far on Day 1. Wow, Michelle, you own a HUGE amount of books! Cool! Sounds like you have a busy week...I didn't realize Goodreads hosted readathons....an entire week is a long readathon! I'll have to pay more attention to that site! Your boys are adorable! So is spoiled Alice! It's awesome that your researching ideas for a historical novel. You can do it, I believe that! Good luck with your week & your writing. I'll be back to read your other Armchair BEA posts! I love that your cat wore a birthday hat! May your dreams of writing historical fiction come true. It is one of my favorite genres. I want to attend BEA as well and I'm not ashamed to admit that I just want to grab every galley I can! I love that photo of your cute boys...and Alice too! Thanks for sharing, Michelle! I cannot imagine owning that many books - I think I must have between 500 and 1000 and I don't have enough bookshelves for those!!! The next time my boyfriend complains about the amount of books I have (I would say less than 200), I will say, at least it isn't over 1000! I think he would kill me! Although I endeavor to have an actual library in my house when I have one some day! Great post! Wonderful comments! Thank you for all the lovely comments. I can't wait until I can show you all my books when I get everything orgnaized!